This summer, the Kellogg School launched a new brand campaign. 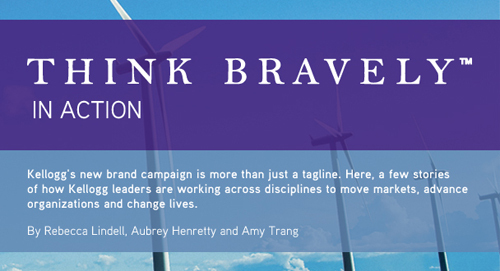 Carrying the tagline “Think Bravely,” this campaign articulates what the school stands for in today's rapidly changing environment. It communicates our values and relevance in the 21st century. It speaks to Kellogg's purpose — to educate, equip and inspire leaders who build strong organizations and leverage the power of markets for the betterment of all. Kellogg has long been known for pushing boundaries and challenging convention. We've always balanced the study of markets with management, valued people and analytics, and believed in the transformative power of organizations to address the most challenging problems confronting business and society. “Think Bravely” nods to this heritage and builds on it. to finance and beyond. Here, a few of their stories. In December, faculty from across academic departments will have the opportunity to participate in their own global immersion inspired by students' Global Initiatives in Management course. The faculty group will visit four cities in India to meet with government officials, business leaders and alumni to gain a better understanding of the country's business environment. Exploring topics that range from marketing to economic policy to operations, faculty will use their findings to support future research and bring a greater international perspective back to the classroom. described Joshua Rauh's research on state and local pension systems in the United States. A leading authority in the national pension fund debate, Rauh has made headlines with his predictions that without basic reform to the current pension system, many large state pension funds will “run dry,” some as early as 2018. Rauh's research has been cited extensively in deliberations within the U.S. Congress, and has played a major role in national policy development. “Thinking bravely means being humble enough to recognize that our talents are limited, but ambitious enough to believe that it doesn't matter. The Global Health Initiative is a partnership between private industry, nonprofit donors and academia to develop products that address health issues in underserved communities around the world. Through GHI, nearly 500 Kellogg students have worked to address issues such as diabetes in India and HIV/AIDS in Africa. Fast food giants don’t scare Peter Tan. After scaling up McDonald’s presence in China and overseeing some 75,000 people and 1,250 restaurants, Tan stepped up to an even bigger challenge: beefing up Burger King’s brand in the Asia-Pacific region. Tan, who fundamentally views business success as managing people effectively, hired more experienced personnel into senior level positions, worked to drive operations excellence at the restaurant level and focused marketing efforts on Burger King’s unique selling proposition: flame grilling. Janice Eberly was recently called to Washington to shape America's economic policies. As assistant secretary for economic policy, Department of the U.S. Treasury, Eberly oversees the office responsible for analyzing data and developments in the U.S. and global economies and financial markets. To most investors, a company with a plummeting stock price looks like a red flag. To Jeff Ubben, it looks like an opportunity. That's because Ubben invests in — and turns around — failing or undervalued firms, particularly those with intellectual property rights in healthcare, technology and information services. Ubben knows how to make changes that quickly generate value, and he differentiates himself as an investor by taking on illiquid assets and working with companies for a longer-than-typical period of three to five years. In the mid-1990s, John Wood was director of business development for the Greater China Region at Microsoft. In 1998, he left it all behind to lead a life of service. Room to Read began with a humble request to donate books to children in rural Nepal. Today, the nonprofit helps communities throughout Asia give children the resources they need to complete secondary school. To date, Room to Read has built 1,443 schools and 12,074 libraries, serving 6 million children across the developing world. An active member of the NAACP since her tenure as an undergraduate at Virginia Union University, Roslyn Brock became the civil rights organization's youngest chairman ever in 2010. Since then, she has introduced and led the Leadership 500 Summit, an initiative to recruit, train and retain a new generation of civil-rights leaders — and to encourage them to lend diverse areas of expertise to the NAACP. Convening global leaders in business, government, nonprofits and academia, the Kellogg Innovation Network (KIN) promotes prosperity through innovation. Founded in 2003, KIN provides leaders with an ongoing platform from which they can share challenges and solutions. KIN delegates, for example, have contributed to the Icelandic government's innovation-focused strategy for growth, raised funds to build women's business centers in Africa, and created partnerships to improve health education and treatment in rural India. Before John Schweiger was a counterinsurgency expert for the U.S. Department of State, he was learning how to undermine insurgents firsthand in Afghanistan. A former U.S. Marine, Schweiger spent his first few post-Kellogg years working for USAID in Nangarhar Province, Afghanistan, where his job was to convince the local population that the United States and its allies had “a much better value proposition than the Taliban.” In 2006, he returned to the United States to co-author a counterinsurgency manual for the Department of State. Angela Lee thinks unconventionally about how consumers think, and how their emotions and goals affect their choices. She also thinks about the impact that marketers can have on the world beyond products and profit. A consumer psychologist, she researches consumer motivation, cross-cultural consumer psychology, and non-conscious influences of memory on judgment and choice.